This is what Dr. Jeff Dichter, an ICU Medical Director wrote gratefully to Rabbi Esther Adler of Mount Zion Temple in Saint Paul, Minnesota after her sermon on Yom Kippur, a major holy day in the Jewish calendar. “As health care professionals,” he continued, “we sometimes wonder ‘aren’t there others in society who might help all of us consider these things ahead of time?’” The medical intensivist found one of those “others” in a rabbi who talked to her congregation about end-of-life care. Rabbi Adler is not the only faith leader prepared to help their communities. 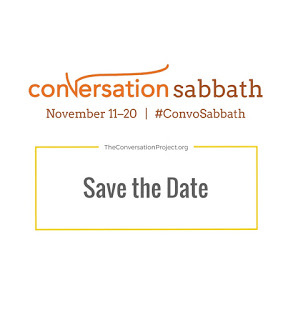 During Conversation Sabbath, Nov. 11-20, clergy of many faiths are joining Rabbi in encouraging their congregants to have “The Conversation” about your wishes with your circle of loved ones and have it sooner rather than later. To start talking around the kitchen table, not waiting until there is a crisis in the ICU. Rabbi Adler chose to address her congregation on these themes earlier this fall because Yom Kippur is the most well-attended service of the Jewish year and she wanted to promote the mission and tools of The Conversation Project to as many people as possible. During the week of Conversation Sabbath 2016, the Mt. Zion community will be hosting a workshop on how to use The Conversation Project’s free Conversation Starter Kit—a guide to reflecting on and articulating one’s unique, values-based wishes for care at the end-of-life. The Conversation Project aims to reach people where they live, work, and pray. As part of our strategy, we reach out to congregations because they are pre-existing communities that encourage living with more compassion and less fear--things we all need if we are going to engage in these kinds of tender conversations. Faith communities have long been places where seeds of cultural change were planted on issues like abolition and even marriage equality. Now we are advocating culture change to break a taboo that stops so many from talking about what matters most toward the end of life—not just what’s the matter with us. By using the “power of the pulpit,” clergy are encouraging their communities to face and embrace the reality of our mortality. This is a meaningful and mature spiritual practice in most faith traditions. It is also a support to health care professionals and family care-providers, as well as people with advancing and serious illness. Like doctors, clergy are called upon to support people through illness and dying. But--also like doctors—clergy do not all receive training in how to have these crucial conversations. Conversation Sabbath is a gentle way to begin having crucial conversations about end-of-life care wishes with loved ones and congregants. And it is a way to encourage more clergy to be the allies health care professionals like Jeff Dichter have been seeking. Joining Conversation Sabbath is easy. Simply register your commitment to preach or teach about the importance of talking about your wishes for end-of-life care at The Conversation Project website. The Conversation Project will direct you to free tools and resources for a successful event, including sample sermons. We encourage Palliative and Hospice care organizations to reach out to community clergy in your service area to encourage them to join Conversation Sabbath this month—or pick any time that fits in their liturgical calendar to share the message that talking matters. Clergy are poised to be compassionate allies to health care professionals serving the most seriously ill. Please share the idea of Conversation Sabbath and cultivate new partners in the shared purpose of reducing suffering for patients, their loved ones, and all who care for them. Rosemary Lloyd, BSN, MDiv, is the Advisor to Faith Communities for The Conversation Project. A former nurse and Unitarian Universalist minister, she is a champion for embracing the reality of our mortality as a spiritual practice for cultivating courage, compassion, and loving life.